IP Result of anti-TRPV6 (IP:13411-1-AP, 4ug; Detection:13411-1-AP 1:300) with mouse kidney tissue lysate 4000ug. 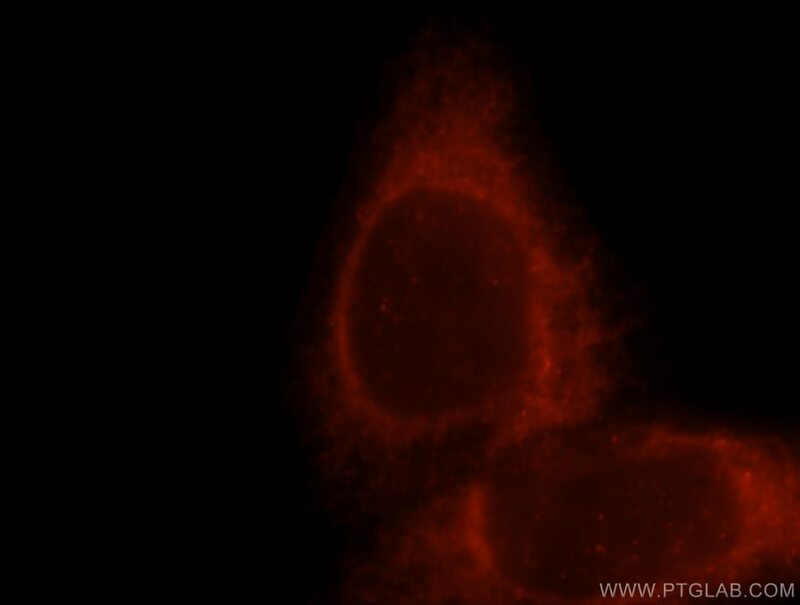 Immunofluorescent analysis of Hela cells, using TRPV6 antibody 13411-1-AP at 1:25 dilution and Rhodamine-labeled goat anti-rabbit IgG (red). 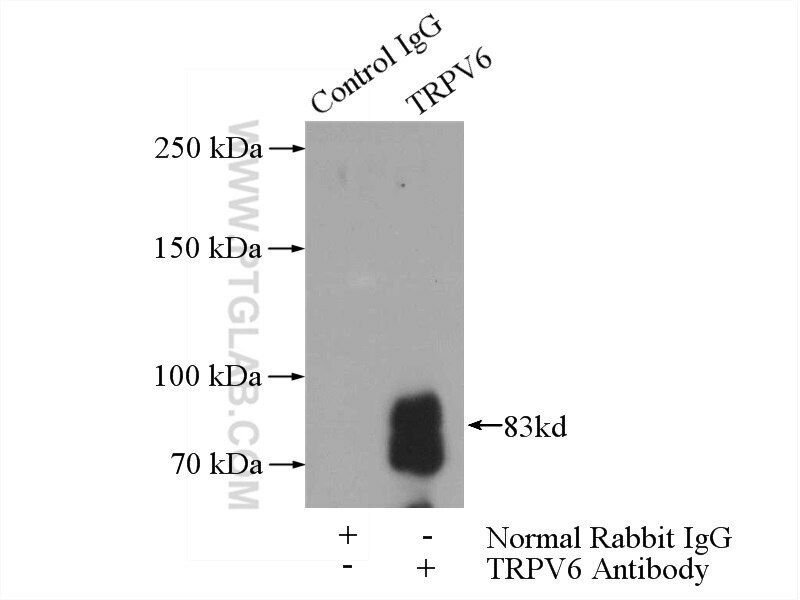 TRPV6, also named as CAT1 or ECaC2, is a member of the transient receptor potential (TRP) family of membrane proteins. Unlike most TRP channels, TRPV6 and its closest relative, TRPV5, are calcium-selective channels. TRPV6 is highly expressed in the proximal intestine, placenta and exocrine tissues (PMID: 12869611). It is probably involved in calcium absorption in various tissues, including calcium reabsorption in kidney. TRPV6 is overexpressed in some cancers and exhibits oncogenic potential. Tamoxifen inhibits TRPV6 activity via estrogen receptor-independent pathways in TRPV6-expressing MCF-7 breast cancer cells. Expressions of TRPVs in the cholesteatoma epithelium. TRPV6 protects ER stress-induced apoptosis via ATF6α-TRPV6-JNK pathway in human embryonic stem cell-derived cardiomyocytes. Aqueous Extract of Mori Folium Exerts Bone Protective Effect Through Regulation of Calcium and Redox Homeostasis via PTH/VDR/CaBP and AGEs/RAGE/Nox4/NF-κB Signaling in Diabetic Rats.